Optical path demonstrator for Laser reflection and refraction testing. Laser light beam path through a fiber example. Smoked lucite for maximum beam visibility. Curved surface path. View the entire path of light as it passes through this curved bar. It's made from a unique smoked LuciteTM that scatters light, unlike normal glass or acrylic. 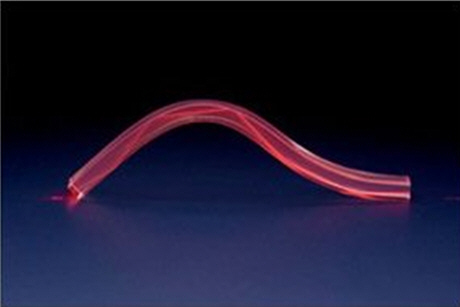 Now students can see total internal reflection and how light travels through fiber optic cables.